People tend to see something one way until someone shows them another. Anyone who knows the art of Frank McEntire, whether sculpture, mixed media, or assemblage, will have witnessed his technique of bringing together found objects, often in the presence of natural materials like stone and wood. Sometimes religious expressions from contrasting traditions resonate with one another, revealing the deeper harmony among them. At other times, congruous or incongruous objects are grafted together to reveal parallels, showing how a seemingly disparate universe is more unified than it appears. And then there are things that crash together, undermining illusions of humanity as a rational species, revealing instead how much of what we do deserves, even requires, laughing at. A viewer who has pondered these quiet, modest, contemplative works might find it hard to credit reports of McEntire’s exhibition featuring formally displayed ranks of uniform boots and helmets, brutal-edged weapons, and a battering ram capable of bisecting buildings when deployed by a squad of armored warriors. Yet these works do exist, and will be unveiled at Nox Contemporary on April 20th. The story of just how they came about begins with a seeming digression of McEntire’s 15 years ago, a turn away from investigating material goods and their possibilities. After 9/11, a cataclysm that left almost nothing behind from which he could fashion art, and in particular the destruction of numerous World Trade Center buildings, there remained an enormous amount of debris, but from moment to moment it was untouchable: at first too dangerous, then too sacred, and finally too vast and anonymous. What everyone saw, even if only repeated in video, was disintegrating architecture falling from a sky full of smoke, dust, and millions of pages of paper fluttering like giant flocks of birds. But what McEntire saw in person were the unbearably poignant memorials, some on walls, others on fences, that sprang into being in the search for survivors, but which, when none came forth, soon enough fell back into an older, implacable role. Death demands everything, but returns nothing. It was with this image of fences covered with desperately shouted hopes that he began Spontaneous Memorial, an effort at amelioration installed over the intervening years in places all around the nation. Like so many of his works, it evolves with each repeated showing, elaborated both by him and his viewers. With the awareness of human fragility created by so much dust blown on the wind, McEntire fashioned an interactive memorial in which the fence becomes a walk-through ghost of the towers, wherein aesthetically weathered images of the lost were doubled by an opportunity for late arrivals to add their voices. His goal was to renew the material presence of those who were both physically obliterated and instantly subtracted from their own lives and their communities. Like all good artists, he wanted to keep whatever references he made specific, rather than generic: gritty and not idealized. Spontaneous Memorial continues to tour, and will show at Bountiful Davis Art Center in August and September. But the meaning of 9/11 has changed as America has changed, and its evolution in time demanded a new installation. First Response echoes Spontaneous Memorial, but addresses a more inclusive topic. Metaphorical references to tragedy can elicit very powerful emotions, but they require explanation and intervention to complete the connection—that and reference to the patient viewer’s own experience. In First Response, McEntire connects more directly by returning to the use of original materials. The key to First Response, as to any McEntire exhibition, is assemblage, one of a handful of strategies by which modern artists found their way out of the labyrinthine trap of abstraction. When abstract art first appeared, early in the 20th century, it looked to some as though this “pure” art would forever replace representation. Instead, abstraction underscored the central role in human perception played by images and stories. Eyes and minds constantly search for things they recognize and that are familiar. Once mainstream artists and critics had agreed that representation was passé, leaving behind an art made primarily of patterns and geometry, the problem was how to reintroduce the recognizable subjects those eyes and minds constantly sought, and all too often found—even in abstract works whose makers had not intended them to be there. 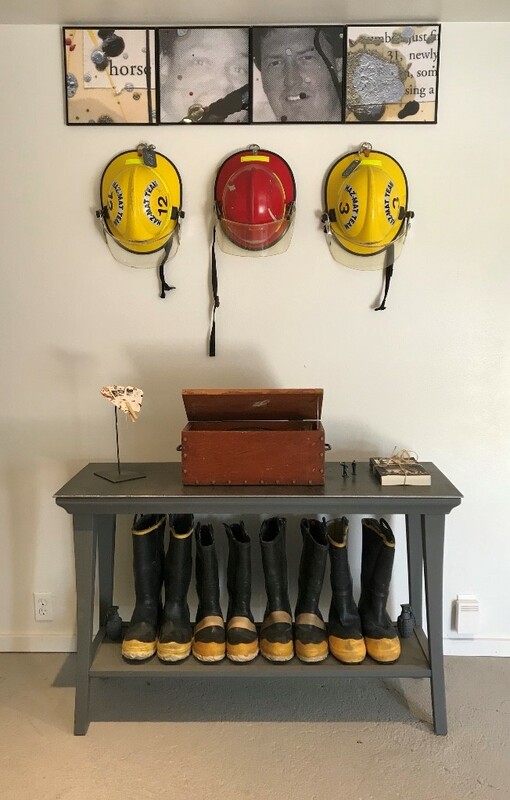 In assemblage, found objects simultaneously provide reassuring subjects while stimulating the kind of preverbal feelings and association abstraction evokes. Dadaists, Surrealists, Ed and Nancy Reddin Kienholz, and Frank McEntire have all made popular art using this technique. Much has been marked by social and political commentary, often including harsh and even mocking juxtapositions of sacred and profane images. Alone among them, McEntire has sought to direct the audience’s gaze past shallow, seemingly judgmental readings in favor of calmer, deeper, contemplative connections. In the months and years following 9/11, many artists tried to express the broad and subtle varieties of shock, horror, and grief that resulted. But over time, as remembered events acquired mythic proportions, and as short story master Lorrie Moore put it succinctly, “with a myth’s errors and idiosyncratic details,” the range of recollected responses narrowed, the majority of workaday victims received less and less attention, while the police and firemen who died or were injured overtook them as symbols of the tragedy. Then again, while McEntire’s art is driven by sensed and felt connections he makes between the meanings of whatever he finds, he’s also influenced by the availability of evocative things. His focus, which may contract to a scalpel point in response to one find, otherwise expands with his widely inclusive interests. Gallerists can, and often do, influence their artists in this way, and so Nox Contemporary owner John Sproul put McEntire in contact with materials related to the 9/11 story, extracted from a pipeline for the distribution of merchandise available in quantities too small or too damaged to be suitable for normal commerce. These included remnants, or occupational traces, left by the “first responders” to mishaps and disasters. Prior to 9/11, these mostly-anonymous men and women risked their lives under often dangerous, sometimes fatal conditions, celebrated in fictional, especially dramatic or comedic motion picture and television accounts, while the reality of their work languished out of sight. But after hundreds of first responders died on 9/11, and even as hundreds more who were disabled were left to fight for the care and compensation they deserve, public awareness and the status of these benefactors rose. Yet as so often happens, little has been done to correct the distorted ways much of the public sees and thinks about them and the work they do. Status seekers have even identified with the first responders unjustifiably: if not by understanding the deeds they do, then dishonestly by crediting the same risks to themselves. William Carlos Williams summed up the truth to be found in physical objects when he said that, in writing poetry, he found “No ideas but in things.” Following this shared precept in his art, and with this unpredictable access to such a new family of plangent materials, McEntire had a chance to explore what they might be found, or made, to say. First Response, with its emphasis on defensive gear and tools that resemble medieval weapons, is his own first response, interspersed with his usual contingent of mysterious and suggestive hybrid objects: a spool of rope or a fire hose deteriorated beyond any conceivable usefulness, yet carefully stowed against some future contingency; a battered and rusty bucket in which a reclusive stone floats; a house with a chimney spouting a pillar of smoke that augers doom—or mirth. Humor comprises an essential, inescapable part of this art, but McEntire rarely admits when or where the laughter fits. To laugh at one of these delicately balanced objects, a viewer must first commit to a choice. McEntire has set aside part of the Nox gallery for his own examples, which begin with the overall title: First Response. Closing the circle that began with 9/11, there hangs over this exhibition the realization that this no-longer-new century began with a disastrous political and military first response to an outrage: an ineffectual and catastrophic response for which no one wants to take credit, but which produced plenty of blame to go around. To visit with McEntire in his studio is to see how the objects he has collected—uncounted thousands of every size and description—converse in his imagination. These conversations become his art. But it’s also to hear how he arranges and rearranges the words that make up the language of our day. “I try to connect things on the pedestal,” he explains, revealing how, for him, this elevated platform becomes a theater for intellectual and civil, but always public discourse. “I am the object whisperer,” he says wryly, but it’s true, as is the awareness he conjures from the objects he induces to converse. That coil of fragile rope, fit only for donation to a museum where it can do no harm? What does it say about other museums’ contents? What would happen if the antique art that celebrates past revolutions were to come off the gallery walls and again address the public? Imagine it, carried by the youth who today carry images of firearms. Might they not rekindle the spirit of citizens past—their desire to overthrow their corrupt rulers and choose their own fates? For Frank McEntire, art still has the power to liberate his audience from the surfeit of things, of material possessions in which Americans today are in danger of drowning, and instead of being carried along by them, wield them like weapons of the mind.